Travellers be warned: Queensland is a huge place and even those who have planned ahead with a sturdy Noosa Heads car rental vehicle will have to spend a fair bit of time here to see and do it all. CarHire.com.au provides all the best Noosa Heads car rental deals in one place, making them easy for you to compare and book. You can see what all the major car rental companies have to offer for Noosa, including Budget, Avis, Thrifty, Europcar, Hertz and Red Spot. The great thing about hiring a car rental vehicle for Noosa Heads is that this allows you to explore the rest of the gorgeous Queensland coast. Noosa is within an easy two hour drive from Brisbane - Queensland's capital city - and comprises Noosa Heads, Noosaville, Noosa Sound, Noosa Junction and some cute satellite towns nearby. Collectively this forms part of Queensland's Sunshine Coast. Noosa itself is very much a resort city. Other popular activates include Harley Davidson riding tours and trike tours. Most of all, though, Queenslanders love to holiday here for the peace and tranquillity. There is something innocent and pristine about Noosa that has survived modernisation. Car Rental ideas for Noosa Heads! If you're booking a CarHire.com.au car rental vehicle and heading to Noosa in October then why not schedule your trip around the Noosa Triathlon. This is a multi-sport event and always draws a great crowd. Book a CarHire.com.au car rental and you'll save money and get the most out of your Noosa experience. However, if you are basing yourself in the State capital of Brisbane then bear in mind that Noosa is a 160km drive up the coast and traffic can be a bother during school holidays or weekends. Noosa Heads will make your vacation remarkable and memorable! If you've already hired a Queensland, Brisbane or Sunshine Coast car rental then make sure you schedule Noosa into your itinerary. Noosa has all the beauty of the Gold Coast – the locals will tell you it's actually far greater – but without as much development and less of a 'city' feel. Here you'll really be able to feel the stress and energy of city life seep away as you relax in lush forests and seemingly untouched beaches. When you're not working hard on the tan at one of the gorgeous beaches or exploring the greater Noosa region then you should definitely book in for some serious R&R at one of the many day spas. Noosa is the perfect place to nurture your body, mind and spirit! The Noosa Springs Spa offers a great variety of treatments in luscious surroundings. Sienna Spa is an award winning salon located righ in Sunshine Beach. Expect pampering and relaxtion to be on the menu including the Hydradermie facial. Noosa regularly attracts an eclectic group of sun seekers including surfers, couples, families and executives on business. If you need a place to get away from it all then you'll be hard pressed to outdo Noosa as a location. With kilometres of pristine sand edging both calm and tumultuous spans of ocean Noosa offers the ultimate beach relaxation spot. It doesn't end there though...the lush hinterland is right behind you do enjoy and plenty of little eateries add to the luscious lifestyle experience. If you've chosen to hire a Noosa Heads car rental vehicle then consider doing some scenic drives. They have something to offer all visitors and can be tailored to cater for all interests and budgets. The Blackall Ranges are a popular destination, known as the Sunshine Coast hinterland. Look for the signposts to Eumundi, which is a historic town a little to the west of Noosa. This is also a great opportunity to take some time out at the famous Eumundi Markets. Yandina is where you'll find teh Macadamia Nut Factory and the Ginger Factory. Train rides can take you around the property and children are well catered for. Hop in your car rental and drive just a little way to the very centre of the Sunshine Coast and you'll find Maroochydore. Cruises and kayaking are on offer as well as great fishing opportunities. The Maroochy Shire boasts twenty five kilometres of golden sands and beckoning ocean as well as excellent surf beaches. There's also 2,000 hectares of national parkland. In the 1800s, Noosa's wealth came from the timber and milling industries and tourism didn't develope until the late 1920s. Noosa shire's tourism developed dramatically after the Second World War. Gold miners from Gympie started to take vacations to the area and in modern times there have been many disagreements between developers and those seeking to preserve the area's nature and heritage. You see it's the sun drenched beaches and pristine, powdery white sands that make Noosa one of Australia's top destinations. 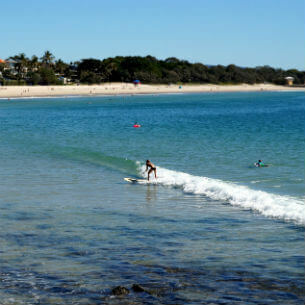 Queensland is known as the Sunshine State and nowhere is this more apparent than in Noosa, where water temperatures always seem to be inviting. Noosa Heads is known for its picturesque waterways, tranquil beaches and pristine natural beauty. Noosa heads is the heart of the tourist district and there's plenty on offer, including but not limited to the wildlife. Hastings Street is a pedestrian friendly thoroughfare with leafy resort accommodation, cafes and alfresco dining. One of the most popular things to do in Noosa is a kayaking tour. These can be done by day or at sunset and can be an intimate, romantic experience or fun filled and full of energy. Don't miss seeing the coloured sands, either by tour or simply on your own. Situated on the southern shore of Laguna Bay and on the far western side of Noosa headland the town has a population of about 10,000. Noosa Heads is the tourism heart of the Sunshine Coast. Famous for beaches and Hastings street this area has so much to offer the domestic & international tourist. Sophisticated eateries European style cafes, remarkable scenery and some very cute locals that call Noosa Heads home. Noosa Heads National park is home to the adorable Koala. This little native who lives like he's on holiday perched up in a tree basking in the sun half asleep as life goes by. Koalas are visible all year round so take a walk through the National Park and keep your eyes peeled. Now we aren't talking about those who you see on the beach but those who live in the trees. If you really want to see a koala in the wild then get in your rental car and head straight to Noosa Heads. The furry creatures are often seen in and around Noosa National Park all year round.